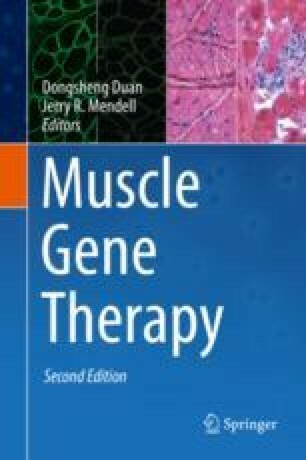 Gene therapy targeting the muscle using adeno-associated vectors (AAV) has a long track record starting from the first vector design in the 1980s until today where systemic delivery to the muscle mass has become perhaps one of the most sought-after therapy designs. The unparalleled efficacy of AAV vectors to deliver robust and long-term expression of the desired therapeutic gene into the different muscle cell types remains one of the top assets of this viral drug. However, it also created one of its biggest challenges: manufacturing recombinant AAV stocks to scale sufficient to fulfill the needs of preclinical studies and phase I to III clinical trials. Ultimately, commercial manufacturing remains a major hurdle, if not a roadblock, toward its full implementation for clinical uses in humans. Nevertheless, robust processes have recently emerged to produce phase I- to III-enabling, clinical-grade AAV drugs and present with promising paths toward commercial use.